Are you looking for Law of Attraction weight loss tips? Are you ready to manifest your perfect body? Then let me share with you how you can start losing weight today with the Law of Attraction. A lot of people will tell you that using the Law of Attraction for weight loss is about achieving the right mindset to stick to a “healthy” diet. They'll give you a list of affirmations about eating well, sticking to an exercise routine, and seeing the number on the scale drop. That is not Law of Attraction weight loss! But what should you do instead? 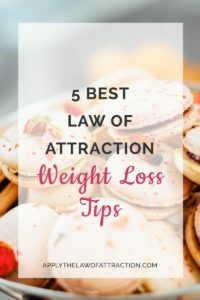 Here are my 5 best tips for losing weight with LOA. 1. Align with your perfect body. The Law of Attraction is about vibrational alignment – you attract what matches the energy you send out, whether that is through your thoughts, your words, or your emotions. It isn’t about following a nutritionist’s advice about what foods you should eat or a celebrity’s exercise routine. Your current weight is a message from the Universe telling you what you have been creating until now. You can create something different. Law of Attraction weight loss is about you becoming a vibrational match to your ideal body. Decide how you want your body to look and align with it by matching its vibrational frequency. What can you do to become a vibrational match to your ideal body? Weight loss affirmations – They can help you align with your perfect body, but they cannot, in and of themselves, cause you to drop weight. Pictures – Find a picture of someone who has a body that matches your ideal body. Place a picture of your head on top of the body. Put the picture somewhere you’ll see it daily or put it on your vision board. Love and appreciate the food you eat with each bite that you take. Thank it for making you thinner. Daily visualizations – They are a powerful transformative tool for creating sustainable weight loss naturally in just minutes a day. I recommend using Mind Movies for your visualizations. You can get six for free through through this link! 2. Listen to your inner guidance. Once you are clear on what is your perfect body, start listening to your body. It knows what is best for it. Your body knows what foods it should eat…and how much. It knows what exercise it needs…and how much. Your body knows when it is hungry, and it has nothing to do with the time on the clock. Maybe one day your body wants pancakes instead of oatmeal. Maybe it prefers hiking to running. Some days your body might want only one meal, other days it might want six. Stop trying to lose weight. Instead listen to your body and trust that it knows what it needs to help you manifest your perfect body. 3. Focus on feeling now how you would feel once you have lost the weight. How would you feel if you had your ideal body? Would you stand differently? Would your clothes fit differently? Would you act differently around people? Would you walk differently? Would you be happier? Would you be trying to lose weight? Focus on these feelings as you go throughout the day. Make everything you do originate from this feeling of having reached your ideal weight. Stand as if you are thin. If you would tuck in your shirt, tuck it in now. Speak to people as if you are the slimmer you already. If you would be more confident, happier, or more talkative, start doing those things now. Be the slim version of you now. 4. Appreciate how unique your body is. It’s easy to fall into the trap of seeing someone else’s weight loss success and wanting to copy everything they did. But your body is a unique combination of your vibrations. How you respond to food and exercise is how only you respond. What is popular in the news…the hottest book on the shelf…the latest exercise rage…it doesn’t mean it is right for you. The hype can get your attention, but your body is special. There is no other like it in the world. Have you ever paid attention to the things you say about your body? How do you judge it for the way it looks and feels? How do you neglect your body or take it for granted? Do you punish your body by restricting how much you eat or limiting yourself to certain foods? Do you spend long hours exercising just to lose weight? If your body was your friend, would your body still be friends with you given how you treat it? Your body is not your enemy. Speak to your body with love. Treat it kindly. 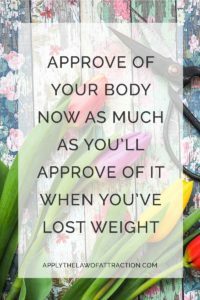 Approve of your body now as much as you’ll approve of it when you’ve lost weight. Let your body know how important it is to you. It is a relationship that will last your entire life. Create a positive, lifelong, loving relationship with your body. Using the Law of Attraction to lose weight is as simple as aligning with your perfect body and listening to your body for guidance on how to attain it.